Today the world needs great hearts, open hearts, hearts like the Heart of Jesus. 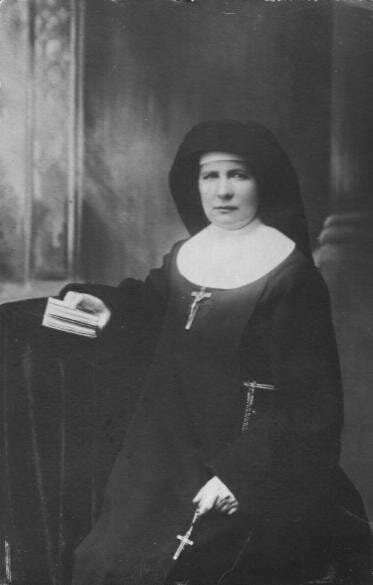 Blessed Klara Szczȩsna was born in Cieszki, Poland, in the parish of Lubowidz, on July 18, 1863. She was baptized one week later in the church of St. Andrew the Apostle and received the name Ludwika. She was the sixth child of Frances (nee Skorupska) and Anthony Szczȩsny. During the difficult years of the January Uprising (1863), she did not have the opportunity to attend school; instead, she learned the arts of reading and writing from traveling teachers. From her parents, she had the opportunity to learn the traits by which she was characterized later in life. Likely from her mother, she learned piety and the desire for a noble demeanor, and from her father, she learned to be hard working and courageous in making decisions. Losing the people closest to her -- first, her brother, and later her mother—impelled her to take greater responsibility for her life. Ever since Ludwika was a young girl, she carried in her heart the desire to dedicate her life to God. Therefore, when under pressure by her father to marry, the seventeen-year-old Ludwika chose to remain faithful to the voice of her conscience and left the family home. She probably lived in Mława with her relatives and earned her living as a seamstress. 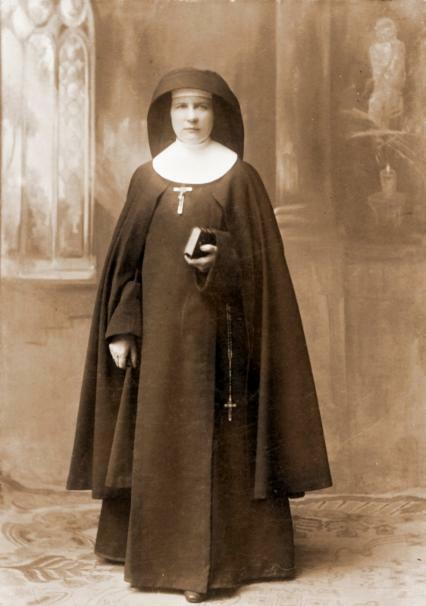 In 1889, Sr. Ludwika professed her first religious vows, and two years later was sent to work in Lublin. She served as Superior there, conducting a sewing workshop and working with the servants. Sister Alojza Rostkowska wrote about her: Ludwika was quiet; she had great simplicity and was full of love for all. These virtues and interior values made her a very pleasant and attractive Sister who had a very good influence on the servants. Sr. Ludwika's mission in Lublin was interrupted by an unpleasant situation that affected her future. Through the indiscretion of one of the servants, a Russian official learned about the hidden Congregation, which resulted in a search of the house of the Servants of Jesus. Thus, the Sisters and the girls were ordered to disperse, and Sr. Ludwika left Lublin and came to Warsaw. Fearing that Sr. Ludwika might be watched by the Tsar's police, the Superiors took all necessary precautions for safety. An invitation from Professor Father Joseph Sebastian Pelczar soon offered an opportunity to send Sr. Ludwika to Galicja, therefore in 1893, together with two other Sisters of the Congregation of the Servants of Jesus, Sr. Ludwika began to work among servant girls in Krakow. While seeking God's will, Canon Fr. Pelczar discerned that a Congregation with religious habits could be founded in Krakow-- albeit it was through a strange course of events, as he acknowledged in later years. He founded the new Congregation, the Servants of the Most Sacred Heart of Jesus. He invited Sr. Ludwika Szczȩsna to cooperate in the founding, which she did with her whole heart and with all the talents God had given her. Blessed Klara valued simplicity and the commonplace and hidden life, seeing in them great benefits for the soul. She found joy in a life dedicated to the Divine Heart, and she encouraged everyone to seek the same joy. She loved meekness and humility, virtues which Jesus invited us to learn from His Divine Heart. The formal founding of the Congregation of the Servants of the Most Sacred Heart of Jesus took place on April 15, 1894, in Krakow. 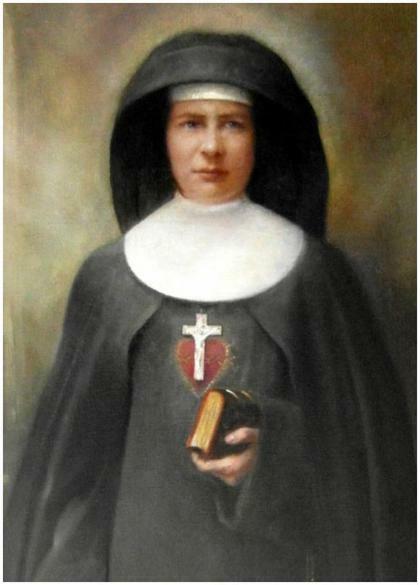 Ludwika Szczȩsna, who took the religious name Sister Klara, became its Co-Foundress and first Superior. The new religious Congregation grew quite rapidly; new convents sprang up as young Sisters arrived. When founding new houses, Mother Klara shared with the Sisters her concern for the plight of servants, girls in need of spiritual support, the sick, and the poor. Sometime later, St. Joseph Sebastian wrote of her: Mother Klara Szczȩsna worked with me in the founding of the Congregation. She was characterized by great prudence and love in directing the Sisters, and with courage and patience in bearing constant illnesses and anguish. During her governance, the Congregation demonstrated remarkable growth. Blessed Klara manifested great goodness and love in her concern for the Congregation of the Sacred Heart Sisters and the works of Christian charity undertaken by them. She said: The Heart of God has called us and continually urges us that we would not falter in our zeal in His service but would rather with dedication --not sparing our strength-- give a firm foundation to our beloved Congregation. She became for the Sisters the first Sacred Heart Sister, Mistress, and Mother. 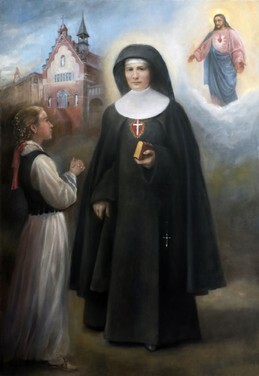 In the Constitutions of the Congregation from 1896, St. Joseph Sebastian Pelczar encouraged the Sisters to do ‘All for the Heart of Jesus.’ These words became, for Mother Klara, the motto and summary of her entire life. To the Divine Heart, she offered each word, deed, and suffering. She told to the Sisters: We must give glory to the Most Sacred Heart of Jesus with our whole lives. We must be obedient to the Divine Heart and offer this Heart our love, and this, not only interiorly, but in action as well, that the love of the Savior may be known and returned by many. We must do this by good example, words, and prayer. Everyone should see in us the Servants of the Divine Heart, Servants of the Merciful Heart, good and open to the needs of man. Captivated by the love of God, Mother Klara, lived with an unwavering faith and an undivided love in total obedience to God's will, trusting God's Providence without limits. She regarded humility as the basis and foundation of spiritual life. Only humility, she said, assures perseverance to the end, and someday, a reward in Heaven. It was silent service to others, without seeking recognition that characterized her spiritual growth and maturity. By leading a deep interior life, she realized God's plan concerning her mission. During her life, Bl. Klara Szczȩsna demonstrated great strength of spirit despite the weakness of her body. She accepted her physical and spiritual sufferings in a spirit of expiation. From the very beginning of the Congregation, she had problems with heart and lung failure, and a few years later, a tumor. At first the doctors delayed surgery, hoping that treatment would prevent the progression of her illness. However, in 1910, after seven years of treatment, Bl. Klara underwent surgery. Unfortunately, the progressive illness caused permanent physical suffering. Nevertheless, this did not prevent her from undertaking the obligations of serving as the Superior General of the Sacred Heart Sisters. Bl. Klara began the last stage of her life in 1915. In October, she had a severe heart attack. During her illness, she was very patient, peaceful, and quiet, readily accepting the suffering with serenity of spirit. When the Sisters wanted to offer a novena for her health, she responded: It is not necessary to pray for my health but only for the perfect fulfillment of God's Holy Will. Mother Klara died in Krakow in the odor of sanctity on February 7, 1916, at the age of 53. She was proclaimed Blessed on September 27, 2015, in Kraków. By the example of her life, Blessed Klara pointed the way to the Most Sacred Heart of Jesus. Her daily life, full of whole-hearted care and a very practical love, came from gazing into the Divine Heart, Who, as a burning furnace of love, is open to each of us. Klara Szczęsna was born on July 18, 1863 in Cieszki in the Diocese of Płock. In 1885, she entered the Congregation of the Servants of Jesus. In 1894 she became co-foundress and first superior general of the Congregation of the Servants of the Most Sacred Heart of Jesus, founded by St. Joseph Sebastian Pelczar. She was strong in faith, sensitive to the voice of God and ever ready to receive His will, and solicitous and open to the needs of the most needy, particularly girls and the sick. She fostered a deep prayer life, especially honoring the Most Sacred Heart of Jesus. She was for all an example of a life of humble love of God and service to neighbor. She died in Krakow on February 7, 1916. The public life of Christ the Lord should especially teach us love of neighbor and zeal for souls. The Lord Jesus Himself is the strongest motive for us to love our neighbor, for He Himself loves him. Indeed, Jesus demands that we love our neighbor; He resides within our neighbor that we could love Him there. If the Manger, Calvary and the Altar speak to you so clearly of Jesus’ love for you, do they not also speak about His love for others? O how you would love your neighbor if you could seek his value in the Heart of the suffering God! With what different eyes you would see this person, who for you seems so unpleasant and unfriendly, if you could but see the immeasurable love for this person from Him who is holiness and justice itself; if you could see the sweet mercy Jesus has for this person whom you regard as unworthy, would you have then but a little mercy for such a one? If you could only know how in some way by hurting this person you are wounding the apple of the Savior’s eye! The love of God and the love of neighbor are one. They cannot be separated for truly the object of such love is one and the same. To love God in and of Himself or to love our neighbor for God’s sake means, one and the same, to love God. Christ’s disciples will identify themselves by their abundance of love. The Heavenly Master has commanded the Apostles to love each other as He loves them and His Heart greatly desires our fraternal love. I was hungry and you gave Me to eat; I was sick and you cared for Me; I was in prison and you came to visit Me. These are the crowns of love of neighbor. Jesus is in our neighbor. Whatever you do for the least of my brothers you do unto Me. At the moment of judgment you will judge not your neighbor but yourself. When you sadden and offend someone, you sadden and offend Jesus. St. Paul, in persecuting Christians, persecuted Jesus. St. Martin in covering the naked man covered Jesus. How dare you refuse a moment of patience, a word of consolation, a service and a piece of bread to Him, who did not refuse you a drop of His blood? In giving us His commandment of fraternal love, the Lord Jesus desires that our love would take the form and likeness of His own, that is, that it would it be supernatural – love for God and in God, not that which arises from nature and the senses. Worship within the soul of your neighbor the image of God and his great ransom through the Blood of God. Love him and hesitate not if, for the good of his soul, you must make some unpleasant reproof. Even should he forget his salvation, you must love his salvation. Love should be universal because the Lord Jesus died for all. Even His worst enemies had a share in His charity. He prayed for His persecutors. If we love God in our neighbors, we acknowledge that there is not one so miserable that he cannot have access to your love. Yet not everyone has the same access. Have a threefold love: maternal love toward those whom providence places under your care, childlike love toward your superiors and sisterly love for your Sisters in God. Have a grateful love. Truly, what people can do to refuse Jesus’ love for them! They do not accept Him when he comes. They persecute and crucify Him and still He loves them. The Holy Spirit says that love is stronger than death. What kind of love is there that will not sacrifice or becomes discouraged and despondent over the smallest things? O how rarely there is to be found a holy and perfect fraternal love! It is easy to have exclusive friends but rare it is to embrace everyone without exception. Such is impossible without sacrifice and dedication. Our love is natural, sensible, egoistic and self-interested. We do not love as the Lord Jesus has loved –loving us even unto the shedding of His blood and desiring no retaliation. As God’s chosen ones, holy and beloved, put on heartfelt compassion, kindness, humility, gentleness, and patience, bearing with one another and forgiving one another. -- As the Lord has fogiven you, so must you also do. And over all these put on love, that is, the bond of perfection. -- Because love is of God. Almighty merciful God, You have accomplished by your grace that blessed Klara Szczęsna, who was filled with the love of the Most Sacred Heart of Your Son and with zeal for his glory, would dedicate her life to sacrificial and humble service of the most needy. We ask you, grant us the grace that, following her example and by her intercession, we would love you above all and lovingly serve our brothers. Through Christ our Lord. Lord, have mercy on us Christ, have mercy on us. Lord, have mercy on us, Christ hear us, Christ, graciously hear us. God the Son, Redemer of the world, Have mercy on us. Holy Mary, most perfect Servant of the Lord, Pray for us. Holy Father Joseph Sebastian, Pray for us. Blessed Mother Klara, Pray for us. L. Pray for us, Blessed Mother Klara. A. That after your example we may be zealous apostles of the Most Sacred Heart of Jesus. Almighty God, source of life and holiness, thanks to your grace, Blessed Klara Szczęsna, with absolute trust, consecrated her life for the glory of the Most Sacred Heart of your Son, and by her sacrificial service to the most needy, gave us an example of faithful love and humility. With confidence, we ask that through her intercession we may give witness to your eternal love before the world. Who live and reign for ever and ever. Święta Maryjo, najdoskonalsza Służebnico Pańska, - módl się za nami. Orędowniczko nasza u Serca Bożego. P. Módl się za nami błogosławiona Matko Klaro. Wszechmogący Boże, źródło życia i świętości, dzięki Twojej łasce błogosławiona Klara Szczęsna z bezgranicznym zaufaniem poświęciła swoje życie dla chwały Najświętszego Serca Syna Twego i przez ofiarną służbę najbardziej potrzebującym zostawiła nam wzór wiernej miłości i pokory. Prosimy Cię z ufnością, abyśmy za Jej wstawiennictwem świadczyli wobec świata o Twojej odwiecznej miłości. Który żyjesz i królujesz na wieki wieków.